Major character is from a non-gendered species with poly families. 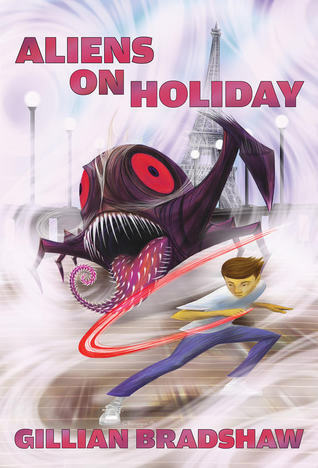 This was a very enjoyable middle grade science fiction adventure, full of likable heroes and dastardly villains, dramatic fights, and a few good lessons as well. Alex is an ordinary English boy, but his friend Shakespeare is far from ordinary. He’s a shapeshifting alien undercover cop, and he needs Alex and his family’s help to catch a gang of other aliens who want to trade drugs for the weapons they can’t get anywhere but Earth. So begins a vacation to France filled with car chases, alien spaceships, monster attacks, and outer space tech. The book touches on serious issues: the drug trade, violence, illegal weapons. In a slight (but well-deserved) jab at American laws, the antagonists are getting their guns from Walmart. Other species outlaw powerful weapons, and Shakespeare’s pacifist culture doesn’t even produce them. Shakespeare’s philosophy about violence was one of the best parts of the story. While he considers the rest of his people a little naive for their inability to conceive of violence and for selling dangerous machinery to known villains without realizing how they’re going to abuse it, he doesn’t accept killing either. He’ll rescue a man he thinks is a drug smuggler, because he’s a person and it would be wrong to let him die. And like the other Dancers, he solves problems through communication instead of violence. Even when talking it out won’t work and he has to resort to trickery, he makes sure no unnecessary harm is done. In addition to the strong morals and thrilling action, there’s a little queerness too. Shakespeare’s species doesn’t have gender. Each individual has between three and seven parents, making Shakespeare’s five average. He’s mostly seen in the form of a male human, which is how Alex knows him best. Shakespeare’s boss knows him best in the form of a female of her species, and so uses she/hers. The one other Dancer we see, one of Shakespeare’s parents, is (a little disappointingly) referred to as he/him in the narration. This book was a lot of fun. There’s things in it for both a young audience and an older one, and I recommend it to both.